Kings have balls. That is not exactly surprising, the two things always went well together. Where you have kings, you have balls. And few kings had more balls than Louis XV of France. Or bigger balls, for that matter. And now get your mind out of the gutter and stop looking up Le Rois medical conditions, the balls we’re talking about are the kind where lots of people put on fancy dress and dance all night. Really fancy dress. And your job in Rococo is to provide the fancy dresses, because the end-of-the-season ball, the biggest event of the year where every rococo gentleman takes his rococo wife or his rococo cocotte – told you I could use the expression in the review! – this ball is the best advertising your dressmaking business can possibly get. Having your dresses seen here will guarantee excellent business for the next year. 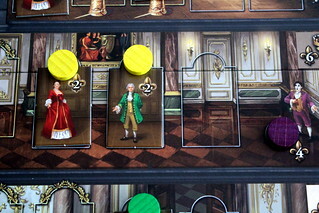 That’s the premise of Rococo, the second game by Stefan and Louis Malz, previously praised for Edo, in cooperation with the more experienced Matthias Cramer (Glen More, Lancaster, …). Together, they created a game that is, in a way, a deck-building game, but without the luck of the draw. You start the game with five employee cards, and part of the game is expanding your business by hiring new employees. But unlike traditional deck-builders, you don’t draw a random hand of cards for each of the seven rounds but pick three cards freely from your draw pile. Only when the draw pile is exhausted do you get to shuffle your discard and use the same employees again, but picking freely from your draw pile makes sure that you don’t get hands you can do nothing with. Interestingly, Rococo is the second nominee for this year’s Kennerspiel des Jahres that creates a more deterministic kind of deck-building game. Concordia does something that, at a basic level, is similar: deck-building with a free pick of your cards, eliminating the randomness of shuffling and drawing. But Rococo is a bit closer to its roots still, deck efficiency is still a larger concern. In Concordia, you can take a turn to pick up your cards at any time, so having cards you never want to play doesn’t hold you back much. In Rococo, you have to play all your cards, so leaving three useless Apprentices for your last hand before you shuffle is a very bad thing and will make you say “Balls”. The other kind this time. 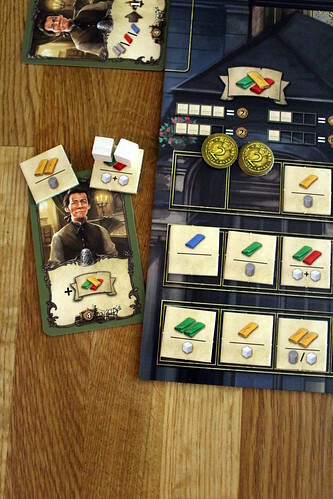 Different from other deck-building games, however, your employees in Rococo do not have an action printed on the card and can only be used for that action. Instead, your employees come in three ranks – Master, Journeyman and Apprentice – and their rank determines which of the six available actions they can take. A Master can do everything, a Journeyman can not hire new employees but is good for everything else, an Apprentice can only take half of the actions, not including making dresses. That would make Apprentices vastly inferior to everyone else. Realistic, but hardly fun in the game. So in return, they get the more potent bonus actions. Each employee card has a bonus action, to be performed after the regular action, and that’s where Masters are inferior to their Apprentices, so which new employee to hire is not a trivial decision. Bonus actions range from simply gaining money or some free materials to actually taking a second action on the same turn, sometimes even with reduced costs. But nevertheless, Apprentices cannot make dresses. They can, however, be sent to the shop to pick up supplies. So can everyone else, but why waste a qualified employee to run errands? When acquiring resources from the warehouse, you pick one of the available resource tiles and pay based on the number of tiles still on that floor. The first tile from a full floor costs you to two Livre – that’s old French moneys, you’re not paying in books – while the last tile on a floor is free. When you take a tile from the warehouse you either discard it immediately and take the yarn and/or lace shown on it, or you keep the tile to use it as cloth later. All those resources only have one use: to make dresses. When you have collected the resources to make one of the dresses currently on show in the workshop windows, you can take the Make a Dress action, pay the resources and a small amount of money if the dress is at the back of the workshop, and then you make a dress.The dress can also be a man’s coat, for the distinguished gentleman not interested in wearing corsets, but the game still refers to them as dresses. The only difference between coats and dresses is that dresses are always made from red and yellow cloth while coats are blue or green. With the dress finished, you have to chose between two options again. You can sell the dress, earning an amount of money somewhere between nice and indecent, but nothing else. Or you can rent the dress to a guest of the ball. In that case, you place the dress on a free space in one of the five ball rooms on the board, mark it as yours and, for some spaces, take a small bonus for it. Getting dresses into the ball rooms is an important part of winning the game, of you hadn’t guessed. Third possible action, you can hire new employees. Only a Master can do that, he gets to pick one of the four employees available this round. Payment is similar to buying resources, the first employee each round is expensive, the last one is free. The new employees, this is important to remember, do not go to your draw or discard pile but to your hand. Hiring a new employee thus makes you have an extra action this round. And if it doesn’t work out with an employee, you can send him away again. With the Depute an Employee action you remove a card from the game and gain money based on its rank. You also get to use its bonus action one more time, a nice going-away present. Of the final two actions, one is to gain the Queen’s Favor. Always important at court. Being in her favor makes you the start player for the next round. And finally, and this is where the game gets a wee bit complex, you can Fund Decorations in the ballroom. Funding them is easy: you pay some money and put your “This decoration funded by Waistcoats’R’Us” sign on it. What is complex is the effect that funding the decoration has on the game, because each type of decoration has an effect. Funding a part of the fountain, for instance, increases your income at the end of the round, either by one coin per dress you have in the halls or by one coin per decoration you funded. 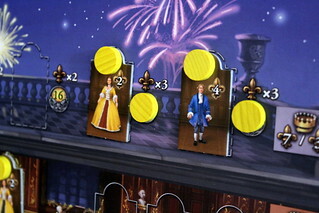 Funding fireworks lets you apply a score multiplier to one of your dressed in the King’s Hall, at the top of the palais. With statues, you score points for sets of differently colored dresses. And musicians count as being present in a ball room for the bonus points for being present in all ball rooms. All those details are visible on the game board, that generally does a very good job in showing all relevant information, so you rarely have to refer to the rulebook. But for the first game or two, it’s still not easy to keep in mind everything you ought to be considering for the big scoring at the end. 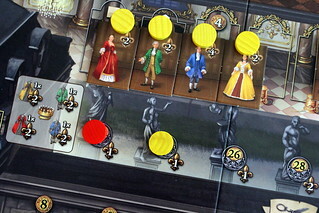 Decorations and scoring are the two things in Rococo that seem a bit challenging when you first read the manual, not because they are very complex but because there are a number of small details to keep in mind. But since you can see all most of those printed on the board, it’s actually much easier than it sounds. Rococo fits the general trend of the Kennerspiel nominees this year: very simple basic rules, lots of options in the details, but overall more challenging in terms of strategy than having complex rules. I enjoy the take the game has on deck-building, where it eliminates the luck factor but keeps the basics of the genre, especially when it comes to deck efficiency as remarked above. Rococo is not, however, devoid of luck. Resources in the warehouse as well as the available dresses and employees are all restocked randomly, and finding a brand new four point dress that fits your leftover cloth from last round is a nice windfall. But those random parts just serve to spice up the game, the winner is not determined by who happened to get the right stuff when they needed it but by who used his deck better. 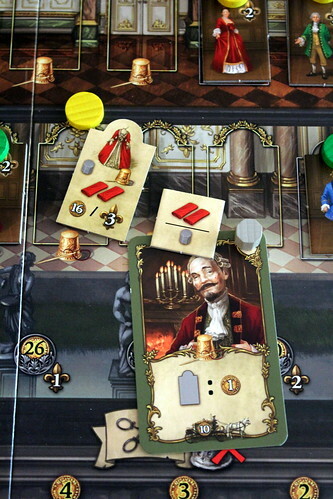 While there is no direct player interaction in Rococo – it would be nice to have some games again where you can trade resources, at least – you still interact plenty when you compete for the limited resources and even more limited space. This aspect of the game is stronger in three and five players, the maximum numbers for the two sides of the board. Competition can be quite vicious then. In contrast to that, two-player games are much more peaceful. But in any number of players, Rococo is a lot of fun. I really hope the three designers will cooperate on more projects, the result of this one speaks for itself. After all, they managed to make a very, very good game about making dresses, a feat previously only achieved by Igancy Trzewiczek with his Prêt-à-Porter. It takes some doing to make me enjoy making dresses, but the intricately linked mechanics of Rococo do it.